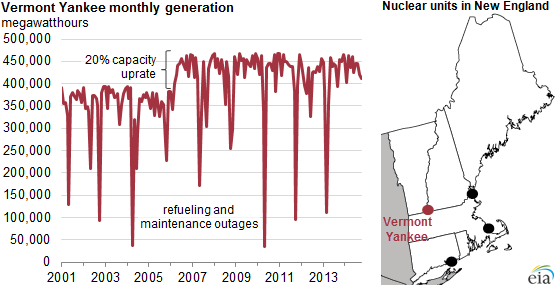 On December 29, 2014, Entergy shut down its Vermont Yankee nuclear facility after 42 years in service. Vermont Yankee had a capacity of 604 megawatts (MW), generating nearly five million megawatthours (MWh) of electricity per year since 2010. As the fifth-largest source of generation in New England, Vermont Yankee accounted for 4% of New England's total electric generation and more than 70% of generation in Vermont. Grid operators in New England have multiple options to replace or offset the loss of generation from Vermont Yankee's closure, and they will most likely use several of them in combination. One option is to operate some of the existing generators in New England at higher rates. 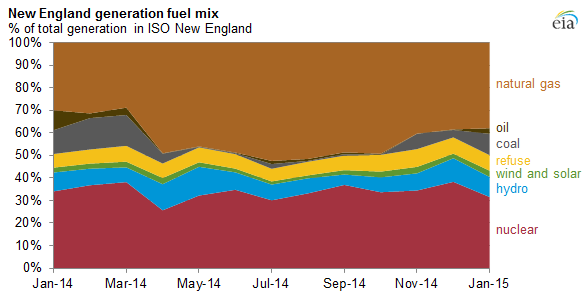 The four nuclear units now active in New England—Millstone units 2 and 3 in Connecticut, Pilgrim Nuclear Power Station in Massachusetts, and Seabrook in New Hampshire, with combined summer nameplate capacity of 4,026 MW—already operated at an average capacity factor of just over 90% in 2014 (based on data through October). Since renewable sources generate power only on a variable basis, any additional generation will likely have to come largely from natural gas-, coal-, or petroleum-fueled units. New England could also import more electricity along its existing transmission connections to neighboring electricity grids in Canada and New York. The Independent System Operator of New England (ISO-NE) consistently imports several thousand megawatts of electricity each hour from those regions. These imports met 14% of New England's demand in 2013, according to ISO-NE. 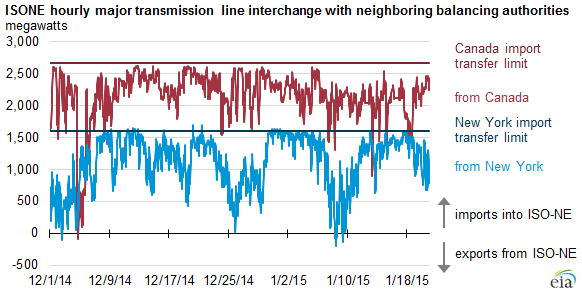 Transmission capacity into New England could also be expanded. The Northern Maine Independent System Administrator (NMISA) traditionally has had more generating capacity than needed and is isolated from the rest of New England, with ties only to Canada. NMISA is currently considering ways to access the New England electrical grid directly, which would add generating capacity for the New England market. Hydro-Quebec is also in the approval process with its Northern Pass transmission project. If constructed, Northern Pass would have the potential to flow up to 1,200 megawatts of electricity into New England. Electricity demand could also be lowered through increased energy efficiency and demand response programs to make up for the generation lost as a result of the retirement of generating units. ISO-NE currently counts 2,100 MW of demand resources (including load management, distributed generation, and energy efficiency programs) and expects this number to increase in the coming years. All New England states participate in the Regional Greenhouse Gas Initiative, which auctions carbon dioxide emissions and uses auction proceeds to fund energy efficiency, renewable energy, and other utility programs. Entergy submitted its Post-Shutdown Decommissioning Activities Report and the Site-Specific Decommissioning Cost Estimate to the U.S. Nuclear Regulatory Commission in late December. The decommissioning process can take decades to dismantle, discontinue, and restore the site. Entergy estimates total decommissioning costs of more than $1.2 billion, including $817 million for license termination, $368 million for spent-fuel management, and $57 million for site restoration.